Try not to wince when you read this - also, this is the same surgery Cano had - and didn't it take him some time to get back? I'm thinking .310/.350/.520/.870, which he did in 50 G, 230 PAs after the 2017 trade to the O's might be within reason. Hi, Doc, nice to see you back. After trying to help keep this place alive, I got shingles in my left arm, and then my father passed away, so I've been on the IL, too. The loss in your family, though, our sincere prayers and well-wishes sir. All blessings to you. The shingles has subsided, but, having RA and all, I now have post-shingles pain (PHN) in my arm, which I'm told for immuno-suppressed patients (i.e., me) can last for as much as a year. I still have pain setting my arm down, and bumping my elbow on something is excrutiating, but, it's lifestyle-threatening, not life-threatening. I had gotten a shingles vaccine some time ago, but time, the stress i was under, and the immuno-suppresents made it come through anyway. Anyone who is over 50 who doesn't get the newer, more-effective vax is not being sensible, to put it mildly for this forum. Dad was 100 years, 10 months old when he passed. He had played tournament tennis until he was in his 90s, then prostate cancer treatment took away his running ability - more the time off conditioning than the actual treatment. But he lived a full life, and had no regrets that I know of. We should be as lucky. But having had him to lean on until this, my 70th year; yes, I miss him. My mother is still living at 97, but has dementia. The last few years she didn't even recognize her husband of 76 years. Dad wanted them both to remain in their home, and we are trying to comply, using in-home care-givers, but there's a lot of stress inherent. If you run his stats back to the beginning of the Second Half last season (7/20/2018) you get a .265/.330/.485 batting line with 8% walks and 22% Ks and a .300 BABiP. That was pretty much my hope for him coming into the season. Since then though, he has dutifully stalked pitches to an impressive degree; that shave in his O-Zone Swing makes me think he can get that walk rate higher and his K Rate lower; toss in a little BABiP juice (his career BABiP is .327) and I think he could be a .290/.370/.520 hitter that matches up real well with Santana and Haniger (His contact creates an OPS just .050 points below Haniger's), at least I think that's his upside. Throw in -5 Runs per year defense and you're looking at a ~5 WIN shortstop in the Trevor Story vein. Here is Tim Beckham's statline since the second half of 2016, minus his time at third base (which came almost entirely during the first half of 2018 when he was in need of/recovering from surgery): .272/.332/.468 over 942 plate appearances. Leaves me thinking mainly that 50 points of patience seems low from his approach. Especially if he rises above the .450 SLG, although I'm sure he's already gotten some pitcher's attentions with how he's attacking. As you suggest, I'd take the 2017 line happily anyway. At 2nd, 3rd or super-sub. He's not looking good at SS. Although the entire left side defense slacking compared to recent years may make things seem worse. Seager being at 3rd could've made things seem much more workable, but he's not and this doesn't. If J.P. Crawford gets into his stride at Tacoma by June, it will be interesting; who becomes the super-UT, and who takes SS? Or do they let J.P. "season" for a season? Also, anybody else wonder how Sheffield must have felt watching Felix throwing to 25 batters with 1 ER? If Felix gets through the lineup like that 3 times each time out, there's no room at the inn! San Diego is still reputed to be looking for a starter. If Justus pitches at Tacoma like ST, maybe Dipoto goes for it with Leake. There's some kids at the tail end of San Diego's MLB top thirty (esp. 24, 28, and 29) that might dress up some future BPs for the Ms. Even if Fifi continuest to pitch like he did in his first start, Sooner or later the Injury Bug is gonna bite. Not to mention needing the keep Kikuchi's innings down. Wait.......maybe we can trade Felix? That's a universal pitching law of some sort. Justice is always served in the rotation. :) Heh. That's good. Its usually served some time in July for the Mariners. There was that 2001 Mariners team that had five starters make a whole year of quality starts. That happened once that has ever been heard of. I'll give dollars to donuts that this isn't the year this repeats for the Mariners if you don't mind sending donuts to Alaska. Ketchikan, and Use USPS express mail. There aren't Krispy Kreme donuts in Ketchikan so those would be preferrable. What is your son doing in Anchorage? Those are Gordon’s current OBP (lower than his BA), OPS and walks/PA. OK, he made a pretty decent play to record the final out the other night, but the guy is pretty not good. SSS, I know, but he was .637 last season and .619 during the 2nd half of ‘18. Can we all agree that two years of data suggests he isn’t very valuable? Guys who have an offensive skill set that begins and ends with wheels age dang quickly. Give me Crawford at SS and Beckham at 2B. Speed ages faster than what tool? I thought it was the slump-proof best-aging skill. Gordon is not done in my eyes. I figured your 2nd half 2018 comment you meant 2017 and not his broken toe 2018 2H performance. Team game 82-162 in 2017 he had .330/.351/.402 with 31SB. Were you using the time he was well-known to have been playing injured to say that he's bad? 3b and SS defense are the focus' for me in rethinking the infield and I think Crawford is the best defender at SS we have. 1 of the 4 DH are already locking down 3b, so Beckham to 2nd then makes the most sense. Why is now the Jerry trade drought? His .619 was in the 2nd half of '18. I get the toe injury. He's healthy now. I'm not seeing a big bounceback. He has 20 games or so to establish he's back. At that point, if not, bench him. I'm predictably gonna take the other side on Gordon. As the guy who summoned him to Seattle with what may or may not be my first successful conjuration spell, cast on this very site no less, I don't see a reasonable argument (yet) that Dee Gordon is past being an average-or-better player. The last year of data is distressing, for sure, but he was injured for much of last year (and was killing it before losing a toe). But hitters like Dee (good contact, zero patience, zero power) are notoriously streaky. He doesn't have Ichiro or Boggs-like bat control, so he is indeed more susceptible to streaks since he can't 'take control' of an at bat like Ichiro could. He doesn't have enough power to make pitchers fear him in any part of the zone, and he won't work at bats and let the pitcher beat himself. When it works, he's as disruptive as any leadoff hitter. When it doesn't, it's about as futile as can be. Still, at this point, a productive Dee Gordon is almost certainly worth more to another club than he is to the M's. Let him reestablish his value (I'm confident he will) and there won't be any difficulty finding a taker for him later this season. Try “Pretty Amazing” and “Pretty Game Saving”. In fact, since we don’t have a closer, let’s re-assign the Save to Dee. It was the kind of play Harold Reynolds would *almost* make, and would win a golden glove for almost pulling off. with career OPS+ of 98, Beckham at 29, 8 games in is at .379/.471/.793 with an unsustainable .421 BAbip. Brett Boone with a career OPS+of 88, turning 32 the opening week in 2001, 8 games in was .400/.444/.633 with an unsustainable .423 BABIP. He finished the year at .331/.372/.578 with a .346 BAbip. That the Mariners get another year of control with Beckham makes it even better if he does have at least a couple plus years in him. Other questions remain, like where to play him considering Crawford, Long and Gordon also being controlled or contracted for at least as long. Your efforts to keep the threads alive, during Doc's offline period, did not go unnoticed. Thank you! I wasn't aware of a Shingles vaccine- I had chicken pox as a child, which I understood would peovide some inocculation, but it sounds like I should look into whatever the latest prevention is. I'm sorry for the loss of your father. He sounds like a great man! I think now (upon his return) is the time to move Seager to 2B and Dee to UTIL. Seager is a 2B turned 3B, but should have been a 2B all along, despite his great 3B defense. 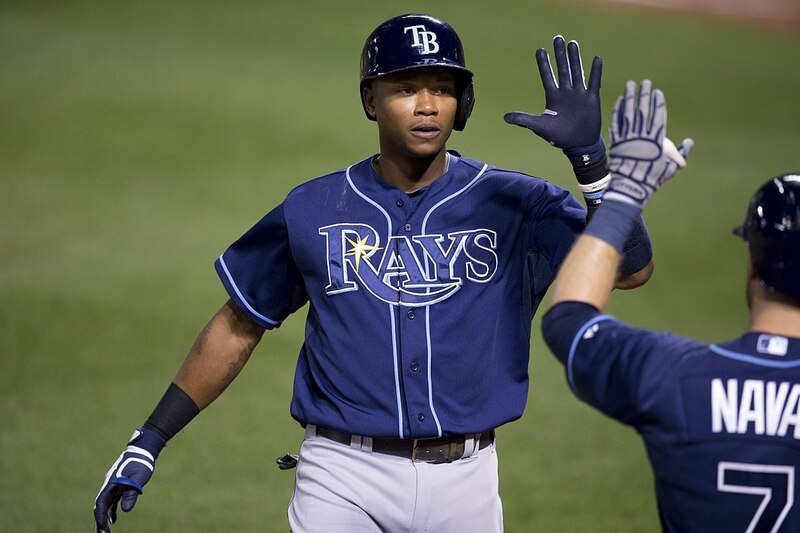 Dee is at the point where he goes from valuable piece to Jarrod Dyson overnight (a year ago). If Healy OPS's .800 and Dee .600, it becomes a very interesting decision. No doubt in my mind that Seager will move back to 2B at some point, the M's will probably just miss the boat and his next team will make the move. But... then who ya gonna play at 3B? Seems like digging a hole to plug a hole! (You prolly want a stronger defender than Healy, even if he OPS's .800. I think Healy is enough of an athlete that he'll put it together and become an average defender. Along with a 30 HR bat, and the threat that Dee Gordon's speed gives us as a pinch runner in a 0 or 1 run ballgame I'm rolling the dice on Healy at age 27 more than Dee Gordon's skillset at the same age guys like Dyson and Michael Bourn begin to become worthless. It might hinge on Vogelbach booming the ball, like he did the other day. If his bat has to stay in the lineup, then Healy at 3rd, Seager at 2nd (Does he have the range?) and Evan White in the wings and due to arrive sometime next year, is an inteeresting proposal. Ryon is the third coming of Jim Presley, who returned the second time in the form of Russ Davis. Despite all the problems, we're down by two- solo shots by Santana and Vogs, and good baserunning by our keystone combo. Unfortunately, Gordon now replaced by Moore. Perhaps he tweaked something, getting back to 1B on a PO attempt. Tater for Healy, to tie the game at 6. All right, bpj- I admit, I'm liking Ryon at 3B better and better! The more OPS you can stash in your lineup the better off your team will be. There aren't even really exceptions to the rule. The more OPS you plug in, the more runs come out. Replacing a light hitter with an extra .100 to .150 in OPS means more than WAR would show, imo. The wild cards, obviously, are the speed and defense. Seager, sans the weight he lost, has Gold Glove 2B written all over him. Maybe not literal GG, but good 'nuff to stack some WAR at 2B. Gordon will probably have the defense regardless, but does anyone want to hitch their wagon to Gordon's speed at his age? Remember Dyson? Problem with those player types is they go from real valuable to real boat anchors real quick.
. The young guys are likely to improve, Gordon is likely to become a... utility.. player. MLB Lineups has Encarnacion and Bruce listed in the lineup, yet no Vogs. He’s homered in consecutive games, for goodness sake! EE is 2 for 16 vs. RHP and Bruce is 3 for 26. Bruce’s OPS+ is totally driven by two homers vs. lefties, in 7 AB. Vogs is 4 for 9 vs. RHP, with a 2B and the two homers. So much for the theory of going with the hot bat. Earl Weaver, wherefore art thou? The only feasible reason (well, absent Servais absolutely detesting Vogs) is to build trade value for those guys. Even with the homers, Bruce is an anchor in the lineup. And the anchor that sinks it, not the one that solidifies. What is the lowest OBP a 30 homer guy can have and be valuable to a team? In his seasons when he hit 30 or more dingers (x 3), his OBP was around .290-.310. In those seasons he was generally worth around 2.0 WAR. However, in seasons when he was only hitting 17-23 dingers (also x 3), his WAR dropped to less than 1.0 and in one instance was -0.5. I think you can 100% ignore OBP altogether and focus solely on that guys' OPS. I dont care if he walks or how he gets out. A strikeout saves many double plays from 30HR types. Ask Pujols. If a player has a .900 OPS, it matters very little to me whether his OBP is .250 or .350. His job is clearly to drive runs in, not get on base and wait for the guy behind him to make something happen. I worry about my table setters' OBP and my power hitters' OPS. For example, focusing on OPS for Dee Gordon if he's on pace to swipe 60 bases with a .630 OPS won't give you a very accurate picture of that players strength. Of course OBP may not be Gordon'a strong suit either..
A .900 OPS is good however it is achieved. If I had my druthers, I'd prefer an OPS with .400 something OBP and .500 sluggling percentage as this means that a player is a great well rounded batter with huge power. I love me some slugging, but remain mildly distrustfull of the 200 strikeout TTO guys to be good from year to year, all things being considered equal. That is I'd rather have Bryce Harper 2018 than Khris Davis 2018, but that might just be dumb thinking, as Khris's 48 homeruns win a few ballgames. Khris had 175 strikeouts and 48 home runs. Harper had 34 home runs and 169 strikeouts. We'd prefer the well rounded player, but we ain't gonna kick Khris Davis outta bed. So to speak. Also, the slugging heavy .900s are infinitely cheaper. You get your .875ish all slugging DH types such as Boomstick or Khris Davis for $15 mil per year for a couple years. The .400/.500 guys expect to be paid $200 million at least. Edwin Encarnacion was one of these .400/.500 guys and he makes 3/$60 million for the tail end of his career. How much did Bryce Harper and Cecil Fielder make again? This seems like a lot of premium for about 70 points of OBP. Just wondered how many WAR you could conceiveably get if you hit .200 and don't walk. Right now he's Two True Outcome guy, not a three. If Servais still intends to get him about 350 PA's, I will scratch my head. I had forgotten about that thread, totally. G called this; 2.5 ago he was already Seth Smith. And that makes the last two years of Tacoma purgatory all the more weird. Vogelbach as Youk? Interesting. Youkilis walked 101 pts for his career; Vogs walked 117 pts (SSS) LAST season, when he wasn't hitting rocket shots once a game or so. He had 3 BB's last night. I think it is fair to say that pitchers are being extremently cautious around him right now. Kruk killed AA in in '83. He deserved a late season call up that year. Then he absolutely duplicated those numbers in AAA during the '84-'85 seasons. Yet, still not a late season call up. He was 25 when San Diego finally decided to fish or cut bait on him. Basically he finished his career just a hair from .300-.400-.450. When Kruk came up, he was a bit more spindly-legged than Vogelbach and a few stones lighter, but he still didn't "look" like a thoroughbred. How much of the Kruk (and now Vogelbach) delay is the old Moneyball scout stuff? You know, he doesn't "look" like a ballplayer. Kruk is a fair template, although I think Vogs brings more power. Lind never had Vog's Eye. For his career, he walked just 58 pts. Vog's upside is higher. And then there The Original Bad Bob, er...Boog Powell. When Boog was good he was real real good: He went north of .900/154 five times. Once he was up, the worst season he had was 104. He was an MVP. I have been calling for a Vogelbach "real" opportunity for nearly three years. A bunch of us have. Some day, we will find out what Servais had against him. If I hear, just one time, Servais talking about Vog's production as a result of the extra AAA "seasoning" he needed, I may lose my lunch. He was a better hitter in '16 than Lind was. Ditto in '17 than Valencia. Ditto '18 than Healy. He wuz robbed. So wuz we. I have always loved Vogs two-handed abbreviated follow-through. "Hit" guys do this, guys who hit tons of line-drive ropes. Go look at Boggs, Rose, or Ichiro. I think it is one reason Vogs stays "on" the ball so well, as he just doesn't fly open. And he brings the natural power to launch it, without the Junior-ish finish. Please allow me to get "golfy." On the course, if you want to "cover" the ball, which is the best way to assure your most solid contact, you "punch" it, with an abbreviated finish. Tiger used this famously with his"stinger" three-wood, off the tee. He could hit it 280, by the way. It isn't a foo foo, la la swing; it is agressive, attacking, but abbreviated. That's what I see in Vogs. And because he almost never flies open, he always has the best "optics" of the strike zone. Years ago, Doc wrote about this sort of Jim Thome-like finish (Vogs' is a bit shorter), describing it as if it was Thor, wielding his war-hammer. I like the visual that creates. Thor didn't foo foo, la la anybody; he and his Valhalla-Ville Slugger, crushed 'em: Fastballs, curveballs and Jormungand, alike. I could go for at least 3 golf crossover ideas per week. That idea made several things click for me. With the Thome swing they talk about a “hitter’s box” or “triangle”, essentially assuring good (not maxed) PWR from a rigid chest and upper arm triangle. Has apps in MMA and wrestling also. In the early years, Alvin Davis had the same type of two hand truncated follow through. Very fun to watch. right now Vogelbach is looking like he has a REAL high ceiling to me. Top 2% knwlg of the zone, can take the ball to LF,has 30+ HR potential. 30 HR plus a sky high OBP? Reminds me of Olerud with more PWR. Will let a close pitch go by with 2 strikes because what can you do with a great pitch Anyway? Olerud was one of the few who genuinely hit with that philosophy.
. . . but I think Vogs is even shorter to the ball. His swing path is more like a contact hitter. Remember when he first came up they priased his hit tool, but worried he wouldn't have the power. These were professional evaluators! tough to see past the body type, huh. :- ). As with Youkilis and Kruk. M's are currently 8 games ahead of the Red Sox in the Wild Card chase.